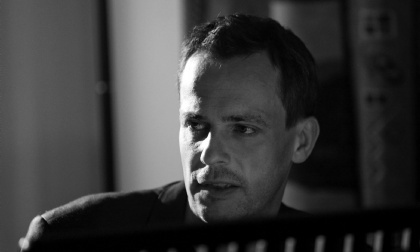 Hannes Loeschel (born in Vienna in 1963) received his musical training at the Hochschule für Musik in Vienna. He started out as a performer of contemporary music, before turning to improvised music around 1990; at about the same time he also began to develop his first crossover pieces as a composer, ensemble leader and arranger. In 1997, his trio “Loeschel Skrepek Zrost” won the Hans Koller Award for jazz and improvised music. Since then Hannes Loeschel has led a number of different ensembles and projects, collaborating with musicians such as Peter Herbert, Josef Novotny, Joanna Lewis, David Tronzo or Ned Rothenberg in live performances all over the world. He has released numerous albums and also realized various productions in cooperation with visual artists, filmmakers, dance and theater ensembles. He is a co-founder of the Soundgrube festival in Vienna and both the artistic director and Artist in Residence of OdeonMusik at the OdeonTheater in Vienna. His oeuvre as a composer includes works commissioned by ORF, WDR, Bregenzer Festspiele, Musiktriennale Köln, Wien Modern, Saalfelden Jazz Festival, Jeunesse, Wiener Volksliedwerk, Diagonale, and others. In 2009, Loeschel obtained a post-doctoral degree in “Composition in Interdisciplinary Contexts” at the Anton Bruckner Privatuniversität in Linz. He works and lives with his family in Vienna.